Lacrosse may be more popular in Canada than in the United States but it’s experiencing an international spotlight by being included for the first time at the 2017 World Games in Poland. Fans hope this will strengthen the eventual inclusion of the sport in the Olympic Games. Lacrosse is of Native American origin and, like other Native American games it has a strong spiritual and cultural aspect. For example, it was used historically as a way of settling disputes and bypassing warfare. Imagine the United States playing Russia on the lacrosse field and the fate of the Ukraine being determined by the team with the highest score. For a number of years, the traditional ways of constructing one of the essential parts of the game—the lacrosse sticks themselves—have suffered as players turned to cheaper mass-produced sticks. Dr. Rodney Haring, an enrolled member of the Seneca Nation is a licensed social worker with a doctorate in social work. He serves as an assistant professor of oncology and research faculty at Roswell Park Cancer Institute in the Cancer Prevention and Populations Sciences Division in Buffalo, New York. I recently interviewed Dr. Haring who is also an adjunct faculty member at the University of Arizona’s Native American Research and Training Center. For over a decade he’s also been active in reviving the traditional Iroquois way of making the sticks and passing this knowledge on to the next generation. You can watch how he does this here: https://www.youtube.com/watch?v=9zSAxzvUZGM. Compete: In full disclosure, I’m American Indian but my mom’s reservation and my dad’s are both west of the Mississippi, meaning that I didn’t grow up exposed to lacrosse. Can you explain a bit of the history for our readers who also may not know much about it – its history and if there is a one particular tribal nation more associated with the sport than others? Dr. Haring: Lacrosse is a traditional and medicine game of the Haudenosaunee, “People of the Longhouse,” often referred to by the French word, Iroquois. In our oral histories lacrosse was played before the creation of Earth and has been with us since. Lacrosse is played for many reasons that are often related to health and well-being. It was also used historically as a means to settle disputes between tribes. There’s a good story that goes along, again from our oral history. I often share this in classrooms when I give presentations on lacrosse and the many things we can learn from it. The story revolves around the Great Ball Game played between the “Four-legged Animals” and the Birds. Compete: How did you learn to make your sticks in the traditional way and end up being one of the few in your area who retains that knowledge? Dr. Haring: In the late 1970s and early 80s wooden lacrosse sticks were prominent. However, with the creation of the plastic stick, the wooden stick lost its place in the lacrosse world. Even today, the National Lacrosse League bans wooden sticks. This is ironic in a way because wooden sticks are the heart of the game. They are allowed in international field play, however. In the 80s when wooden stick production declined, the art of making them seemed to decline as well. It was easier to buy a plastic one; they were lighter and novel for the time. That being said, there’s no “spirit” attached to the plastic stick. The wooden stick in our culture has a lot of meaning and power within it for it comes from the earth. It is created by the man for uses it in a traditional game and the tree’s spirit enters into the game. Even the other parts of a wooden stick are made from living things – the side-gut and leather. This in itself brings life and energy into the game compared to a foreign-made plastic. Back to your question. When sticks became scarce my brother and I started messing around with how to do this. In the past ten years or more, we’ve tried many different techniques. I myself did some in-depth research from text back to the 1600s, maybe even before and trained with some of the contemporary greats, Richard Big-Kettle and Ron Patterson. I’ve also learned from other craftsmen on what “steam bending” means, how to interpret wood and how carving and hand-tools are used. My sticks are not just mine. I work closely with my nephew, Brody Jimerson who is a stringing ace. I usually do the wood collection, bending, carving and Brody finishes with his unique talent. We are a good team. We both teach and share as well. Brody shares his techniques and I often put out informal notice to community members that I will be steam bending and anyone is welcome to help. I share my knowledge as we go and split up the sticks evenly when done so they can try to finish a few. Compete: Is there a major difference between the sticks you make and the ones my readers might see in a catalog or sports shop? Is there a special type of wood you use, for example, or is there something unusual about the material you use to make the webbing? Dr. Haring: Our sticks are hand-crafted using small hand tools and old school carving techniques. It often takes a year from start to finish. There’s a whole process from the time of year to take wood, the type of wood to use, etc. It truly is a process. I see some non-Native “handle” makers that make lacrosse shafts for plastic heads. They are often incorrect portions of the trees and if used in a more rigorous box-style game, they would certainly break. The materials we use are the preference of the player we are making a stick for. But I insist that we use rawhide sidewall instead of nylon. By doing so, it retains the tradition of the game and the integrity of the stick. I also prefer to use real leather leaders instead of “synthetic leathers”. 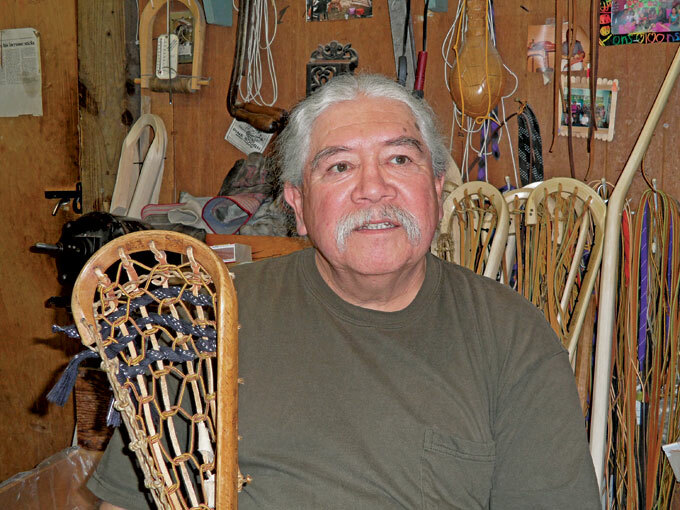 Photo: Alf Jacques, master lacrosse maker, is a member of the Onondaga, one of the Iroquois nations.